posted on Feb. 12, 2019, at 9:00 a.m.
Gordon van Zuiden, owner of the technology integration firm cyberManor in Los Gatos, Calif., attended the annual Consumer Electronics Show in Las Vegas in January. His takeaway? The connected kitchen and bath are big deals — and getting bigger. “With everything connected at higher speeds, we see better screens, voice initiation — we’re seeing some solutions in both spaces that are being advocated by some of the largest electronic companies in the world,” said van Zuiden. 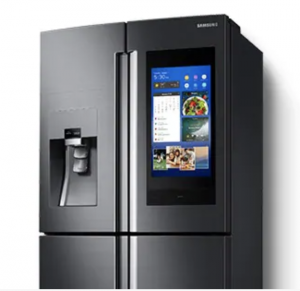 Samsung’s three-door French door-style Family Hub refrigerator. Samsung and LG — to just name two — are betting that smart kitchen “hubs” are the future. Families naturally gather in those spaces, and the universe of appliances that assist and entertain are becoming ubiquitous. The problem with all of this cool voice-controlled tech? “One of the big divides currently out there are the two big voice ecosystems,” noted Peter Aylett of the Dubai-based firm Archimedia. (The two ecosystems Aylett’s referencing, by the way, are from Amazon and Google.) Aylett — also in attendance at CES 2019 — observed that companies whose devices can “work and play well with others” will likely have a leg up. Kitchen and bath designers and remodelers looking to collaborate with CEDIA integrators can find local experts at www.cedia.com.